Should I Buy an HSV Clubsport R8 Gen-F? — Auto Expert by John Cadogan - save thousands on your next new car! HSV (and FPV) fill a particular niche in the market. (The ‘I want something more in the muscle car dept.’ niche.) Whether HSV actually delivers that much more on the performance front is somewhat less clear. Certainly that extra delivery is impossible to rationalise. This is why HSV used - for years - the marketing slogan ‘I just want one’. This was recently upgraded to ‘Just get one’. Both write-offs highlight the fact that a purchase like this cannot be rationalised. Nobody needs an HSV. On objective grounds they are irrelevant and impractical. They’re bought by people who grew up with Holdens and are financially able to buy the best Holden you can buy. Make that ‘most exclusive’ Holden. HSV basically trades in exclusivity. Interestingly, many HSV buyers could part with the $150k or so that it would take to own a very nice German performance car. They’re just philosophically disinclined to go there. Detractors say they’re cashed-up bogans, but HSV owners generally love their cars. I can’t help you with the subjective aspects of the purchase. So let’s take a look at the numbers. 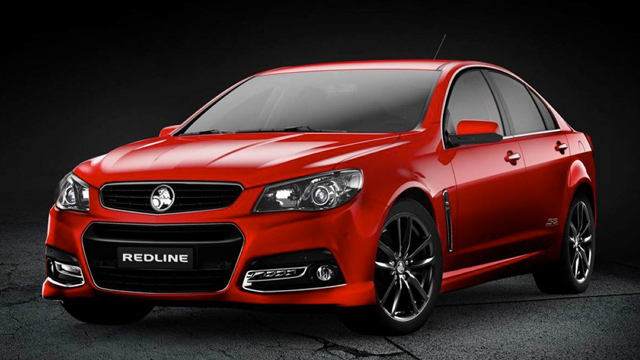 Basically you pay almost $21,000 more to upgrade yourself from a VF Holden Commodore SS V Redline to an HSV Clubsport R8 Gen-F. The specification level is very similar - they both get four-piston front brakes, launch control and ‘competition mode’ stability control, plus interior specs including rain sensing wipers, lane-departure warning, forward-collision alert and a Bose audio system. The HSV adds four piston brakes at the rear, a plus-one tyre fitment, driver-selectable steering weight and bi-modal exhaust ('loud' and 'really loud' being the two modes). And of course, there’s the engine: 270kW @ 5600rpm for the Holden Commodore’s 6.0-litre and 340kW @ 6100rpm for the HSV Clubsport R8. It’s a hefty rise in peak power, but they increased the capacity and you have to spin the engine nine per cent faster to deliver it, making it somewhat less accessible. (So, if the HSV engine’s torque production remains similar at 5600rpm to what it delivers at 6100rpm, it’s making around 310kW at 5600rpm - still better than the Commodore, but closer than you thought.) And there’s 7.5 per cent more peak torque, but again you must rev higher (6% higher) to exploit it. Bottom line: given the underlying commonalities, they probably feel, and perform, in a very similar manner at normal driving revs. Realistically, how often are you going to operate the engine northwards of 5000rpm? And will you really be able to tell the difference? Is it really worth $21,000 more to get what the HSV offers? If you think just like an accountant, you’re paying 40 per cent more and getting 26 per cent more power (and it’s somewhat less usable), plus the four-piston rear brakes, and different hair and makeup. "Cadoges it's also worth pointing out the SS gets its power, torque and fuel economy figures running 95 RON, even though it can use 91. [Chrysler 300 SRT8] Core is much better than expected, we played with them at Targa Adelaide a little while back and wet or dry it did the job bloody well, even if hamstrung by a five-speed auto!" The Chrysler 300 SRT8 CORE walks away with the bragging rights, however, if a real muscle car is all you’ve ever wanted. And the price is certainly right. Slightly more peak power than the HSV, at the same revs, and monumentally more torque. That’s 631Nm for the Chrysler versus 570 for the HSV - and the Chrysler delivers it 500rpm lower, making it even more accessible. Even if the HSV maintains near-570Nm torque output at the 4150rpm where the Chrysler is maxxing out its torque, the Chrysler is making 11 per cent more power at 4000-odd rpm. MUSCLE CARS ... OR MUSEUM EXHIBITS? It’s probably pertinent to talk about the underlying vehicles themselves, because they’re both rolling geriatrics that should have been put out to pasture long ago. Both Chrysler and GM went bankrupt in the GFC, and they’ve had bugger-all to spend on R&D since that time. Additionally, in Holden’s case, the factory here has been losing money in the millions even before that. In Chrysler’s case the basic vehicle (called ‘300c’ from 2005 to 2011, and just ‘300’ after that) remains unchanged for going on its 10th year now - except for minor styling and engine capacity alterations. Neither model is something to shop for if you’re looking for real innovation. I don’t know about you, but for me the Chrysler has much less ‘bogan’ about it. It’s a classier ride. It just looks a lot more upmarket than a hotted-up Commodore with slightly different styling. No car is perfect, and neither Holden nor Chrysler enjoys an especially robust reputation for reliability or quality. But 'muscle cars' are thin on the ground. There's a pretty small pool of contenders. Potential Holden/HSV buyers generally don’t shop their purchases against Ford/FPV - doing so would be heresy in the minds of many - which is why I didn’t include the blue-oval contenders in this response. I guess most of this decision is going to come down to how important it really is to you to drive a manual, because if the answer is ‘very’ then Chrysler’s a scratching and the Holden/HSV is the only game in town. But if you can feel good about an auto then the Chrysler is looking not just good, but awesome.